April 2014. Palo Alto CA Tim Hay was covering Silicon Valley for the Wall Street Journal. Hay found, as you’d expect, a studio full of 20- and 30-somethings. And one anomaly, Barbara Beskind. She was 90 years old —and paradoxically, one of IDEO’s newest hires. Talk about a designer with a perspective on the needs of older consumers. Hay wrote about Beskind on the WSJ Venture Capital blog, posting on April 25, 2014. According to Nuzzel, a social news aggregator, the story was shared 37 times. The next day, the Journal tweeted a link to his story to their 5M+ followers. It was retweeted 107 times. I recently conducted a Google search for “Barbara Beskind”. It turned up one hit from the two-month period following Hay’s initial post, and even that was spurious – it linked to a spammy online pharmacy which presumably buried the search string in hidden text, on a page promoting generic Premarin. On June 17, Huffington Post blogger Jack Nadel linked back to the original Journal story. That triggered a post on Senior Planet, which begat a post on the National Center for Creative Aging’s blog, and mentions by a couple more independent bloggers. At this point in my narrative, you might think, “It’s about to go viral,” but you’d be wrong – in nearly seven months, only a handful of other bloggers picked up the story. Then, last fall, Barbara gave a lecture at Stanford’s elite ‘d-school’ for industrial design. That lecture was recorded, and hosted on Soundcloud. The Soundcloud link was posted on the school’s Whiteboard blog on November 23, 2014. And again, it was followed by months of radio silence. According to the counter on Soundcloud, only a few hundred people listened to Barbara’s lecture. But one of them was Laura Sydell, the Digital Culture Correspondent for NPR’s All Things Considered, Morning Edition, Weekend Edition, and NPR.org. Sydell was fascinated, and on January 19, 2015, she interviewed Barbara on All Things Considered. Over the next couple of days, links to the story showed up on NPR’s All Tech Considered blog, Generation Listen Facebook page, and on NOVA’s Facebook page. Then, the story did go viral. As I write this, more than 100 blogs and web sites have picked it up. It’s been translated into French (Les Affaires, Quebec), Portugese (Portal do Envelhecimento, Brazil) and Japanese. You know your story’s achieved a degree of viral success when it launches in English, is translated into a foreign language, and then that story gets re-translated back into English. I found one example of that—a post that described IDEO as the company that developed “a initial rodent for Apple”. Love that machine translation! Tracking the dates on web posts leaves me in no doubt that it was the NPR broadcast—supported by posts on NPR web sites and Facebook pages—that helped the story reach critical mass. Beatroot, a web site that monitors story traffic for journalists, has a graph purporting to show cumulative traffic to the Barbara Beskind story on Stanford’s ‘Whiteboard’ design blog. According to Beatroot, there were no visits on the day before the NPR broadcast; over the next two days, 560 people dropped by. I did another Google search, for “Barbara Beskind 90 year-old designer”. That string returned over 100 relevant links. Working from top to bottom, I pulled the first fifty links that had easily discernible posting dates, and entered them into a spreadsheet. I used that data to produce a bar graph which clearly illustrates a strong post-broadcast weighting. It’s quasi-scientific, I admit; readers may quibble with the selection of the 50 representative posts, and the posts themselves are not evaluated for reach or impact. But the pattern is unmistakable. Twitter mentions show, if anything, an even stronger skew. I searched for @IDEO on Twitter, going back to January 8, ten full days before the NPR broadcast. Over 100 Tweets contained the string @IDEO, but none mentioned Barbara Beskind. By contrast, in the two days after NPR aired the segment, I found over 70 mentions, including an RT by @ChelseaClinton. On the face of it, it’s not surprising that All Things Considered’s five minute story generated more buzz than the Journal’s tweet. According to Arbitron, the broadcast regularly boasts twelve million listeners. Since my entire business at Revolutionary Old Idea is based on knocking down the advertising industry’s ageism, I’d like to think that Barbara’s story has become popular because more and more people imagine the day when they too will be old. For readers of the Brandwatch blog, however, what’s most interesting is the symbiotic relationship between new and old media in the propagation of this story. 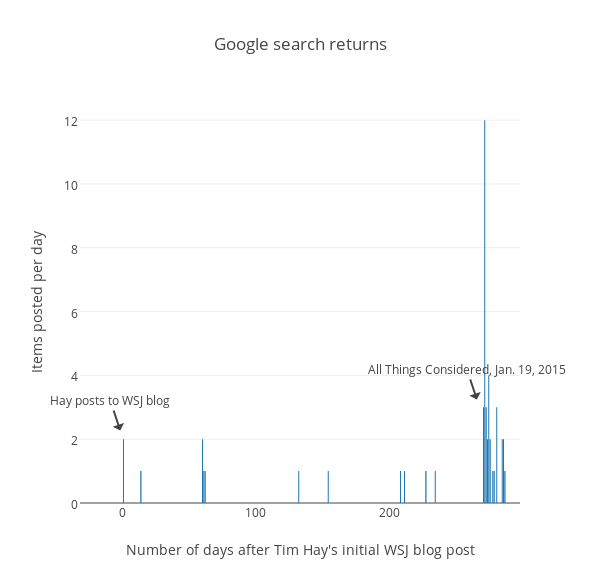 Tim Hay got the scoop, but his Wall Street Journal blog post didn’t get much traction. Then NPR’s Laura Sydell saw a post on Whiteboard—a blog that had only 0.1% of the Journal’s reach. Sydell’s radio broadcast was the catalyst, prompting dozens of follow-on posts. But to be clear, of the 100+ stories that I tracked through the first week of February only Hay and Sydell bothered to talk to Barbara. So basically, the radio show prompted people—either directly or indirectly—to search for Barbara Beskind. What they found was Tim Hay’s original report, and that’s what they used as the basis for most of the posts that caused the story to go viral in January and early February. That suggests that bloggers and online journalists who are trying to be topical (read: fast) will eschew original research, but that—ahem—real journalists will still follow up on a story with legs, even months after the story’s broken. That said, they welcome the continued interest because Barbara is passionate about getting the story out. She hopes that more companies will work with the elderly. She also has so many designs and ideas that she’d like to find partners for, in order to take them to market. I’m sure we’ve not heard the last of Barbara Beskind. If you want your story to take on a life of its own, don’t agonize over whether to focus on new/social media versus traditional media. The two are symbiotic. Be patient. You never know which post—even one on some low-traffic blog—might be the catalyst for viral propagation. And, get featured on All Things Considered.